For more than a decade, one of the big economic questions about China has been: why is the household savings rate so high, and still rising? We may now be getting to a point where the conventional wisdom on this question is changing. I have thought for a while that the evidence for the old conventional wisdom was unconvincing; I’m glad to see that a lot of good research is now providing an alternative. The interesting thing about this recommendation is that the Chinese government actually listened to it: in 2006, government spending on education, health care and social security started to rise sharply. Of course, this did not happen just because the IMF said so. The precautionary savings hypothesis was not only plausible, but also in sync with domestic political trends. A growing chorus of influential domestic scholars were also pushing for a stronger government safety net, since the old one provided indirectly by state-owned enterprises had broken down. The economic argument that this would lower the savings rate and boost consumption was eagerly adopted by this group of people, but, in my experience anyway, they were driven mainly by social concerns. The resulting expansion of the social safety net was the signature accomplishment of the Hu Jintao-Wen Jiabao administration. One thing it did not do, however, was lower the savings rate: social spending went up, and the savings rate kept rising. On its face then, the data from the past decade presents a rather large challenge to the precautionary savings hypothesis: the policy recommendation has been followed, and the predicted result has not been achieved. Of course, you could still argue that the increase in spending was not enough to really alleviate all the well-founded worries about future retirement, education and health expenses. But to me the results of this very large natural experiment suggest we should be looking elsewhere for explanations. This being economics, there are of course alternative theories to choose from. What most of these explanations share is the idea that China’s high savings rate is not a “distortion” produced by bizarre and unreasonable government policies, but a natural response to changing economic conditions. 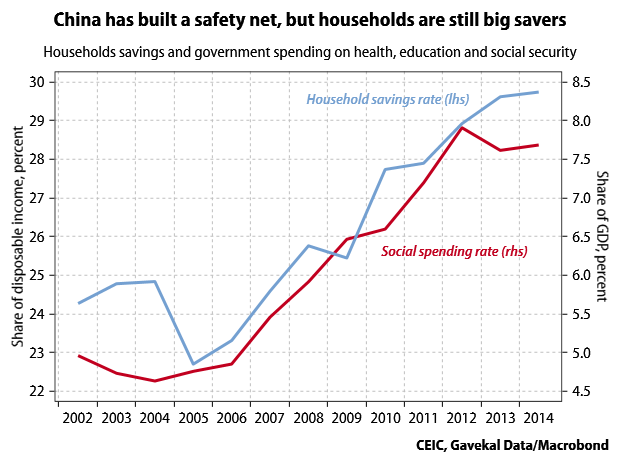 A string of recent papers point to demographics and rising incomes as the key drivers of China’s savings rate. These explanations are also reasonably intuitive. The demographic argument is, more or less, that since China now has more people who are in the stage of life where they do most of their saving, the overall savings rate is high. And in fact we can observe that the share of the working-age population rose sharply as savings rates were also marching higher. The income argument flows from the fact that people with higher incomes tend to have a higher savings rate. This is a consequence of the diminishing marginal utility of consumption: when you start earning more money, you also spend more, but not quite as much more. So if in aggregate people’s incomes are going up, their savings rate should also go up. And given China’s rapid growth, incomes have been going up quite a lot. The excellent Calla Wiemer has been arguing against the precautionary savings hypothesis on these grounds (see this 2010 paper) for some time, but she is now getting a lot more support. An interesting IMF paper from December does a cross-country comparison of episodes when savings rate rose sharply, and finds that such episodes are in fact relatively common, and that they generally followed surges in economic growth. An NBER paper also does a US-China comparison to evaluate the precautionary savings hypothesis, and finds that the difference in savings rates is explained mainly by differences in income growth. Most recently, the latest issue of American Economic Journal: Macroeconomics has a strong paper that comes up with a detailed demographic model for the savings rate (including some factors I skipped over above). And once the authors add rapid income growth into their model, it accounts rather nicely for how China’s savings rate has actually evolved. There is increasingly strong evidence, in other words, that the reason China has had a high and rising savings rate is that it has been experiencing a major demographic transition and a historic surge in income growth at the same time. The implication is that as the population gets older and economic growth slows down–both trends that seem fairly unavoidable now–the savings rate should start leveling off and declining. Another implication is that dramatic policy interventions aimed at pushing down the housing savings rate are not as urgent (and here we might note that government social spending has stopped rising relative to GDP). Let’s see if this emerging conventional wisdom holds up better than the previous version.